When in Europe with little kids, Disneyland Paris comes to mind, especially for Disney lovers. What’s not to love about the city of lights paired with Mickey Mouse? 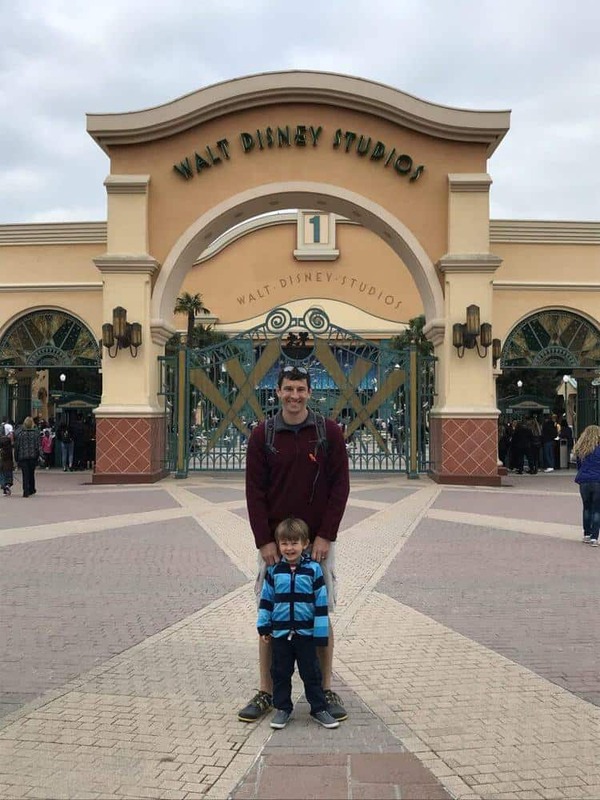 After living in neighboring Germany, we decided to spend a weekend at Disneyland Paris for my birthday. I’ll share Disneyland Park tickets, packages, rides, FastPass strategies, and Disneyland Paris attractions. I’ll also help with getting to Disneyland Paris from Germany or from Paris City Center. 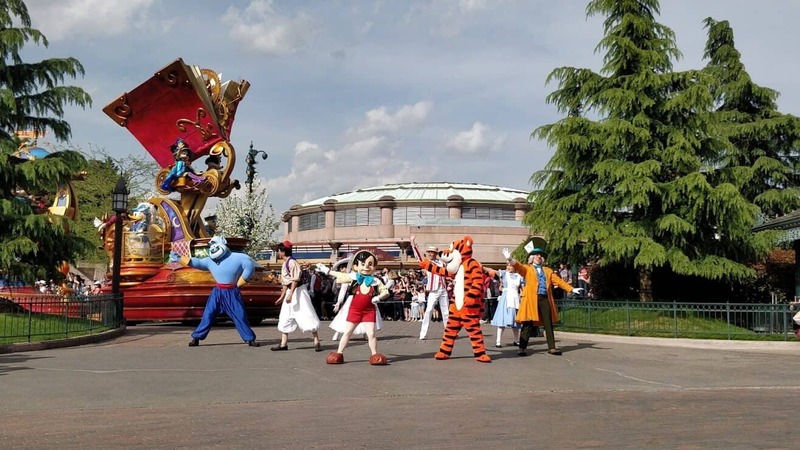 If you need the perfect Disneyland Paris Itinerary, this is the post for you! 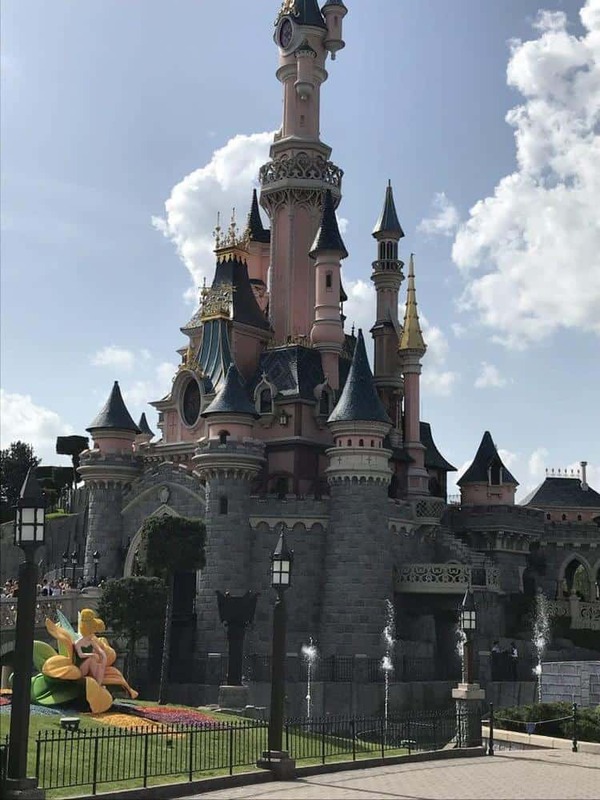 Disneyland Paris features two parks (Disneyland and Walt Disney Studio’s Park), both are included with admission. There is also 7 official Disneyland Park hotel, among other partner hotels. It is certainly not as large as Walt Disney World in Florida, but what it lacks for size it makes up for in charm. How many days do we need? The average answer is 2 days. One for Disneyland Park and the other for Walt Disney Studio’s Park. It really depends on what you want to see and do. If you want to see everything, I’d add another day, for a total of 3 days in the park. With Paris so close, most families enjoy a couple of days in the park and then visit Paris for the remaining time. We’ve visited Paris multiple times, but 5 days is a good amount of time. So if you are flying over from the States or visiting from a country far away, I’d spend at least 7-10 days in the area. There is so much to see and do. More on our time in Paris a bit later, or jump to our “24 hours in Paris with Toddlers”. 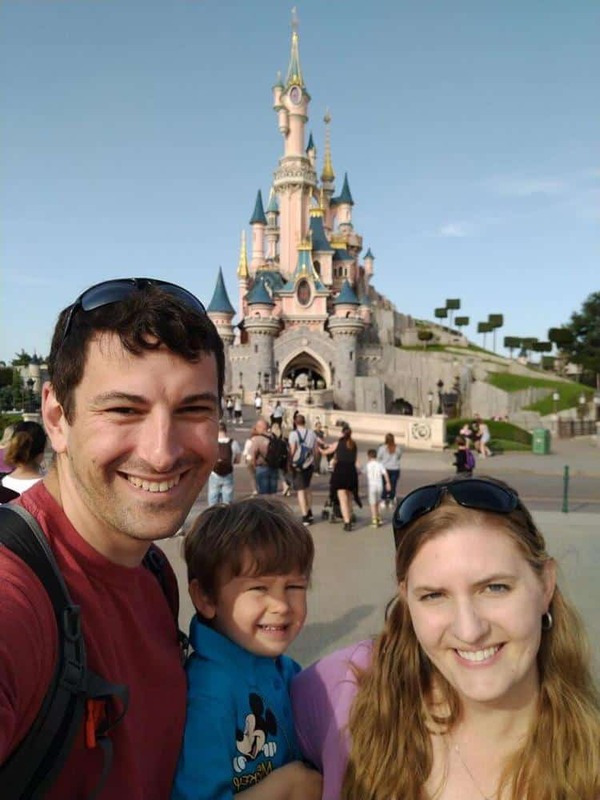 How did we get to Disneyland Paris (from Stuttgart, Germany)? Disneyland Paris is located about an hour east of the center of Paris and is easily reachable by public transportation. Since we were living in Stuttgart, Germany, we planned to take the train. But after purchasing one-way tickets into Paris on the ICE train, we realized that a train strike would make our return complicated. After looking at our options, we decided that my son and I would take the train and my husband would drive. Then we would all be able to return with the car. 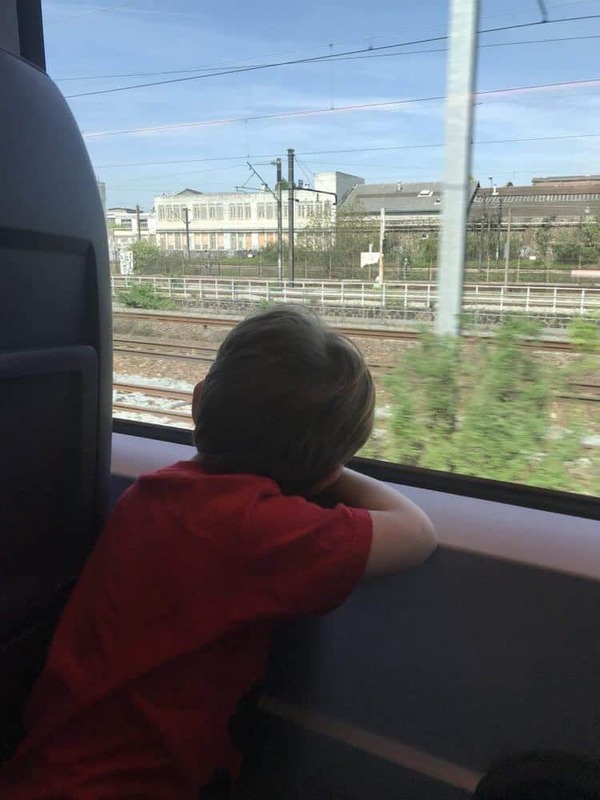 Taking the train: My son and I took the train from the Stuttgart Central Station to Gare de l’Est in Paris. It is a direct train (no transfers) and only takes a little over 3 hours. However, you’ll need to exit the ICE train and transfer to the metro. Once on the metro, you’ll get off at Les Halles to transfer to the RER train. This train will take you to the station located directly outside of Disneyland Paris. Once at Disneyland, you’ll take a shuttle or taxi (depending on your hotel/Airbnb) to your final destination. Driving: Average drive time is 6 hours and you’ll encounter tolls ranging from 35-50 euros each way. The hotel we picked had free parking, so we didn’t have to add any additional costs for that. Conclusion: My husband dropped my son and me off at the train station and then started his drive. 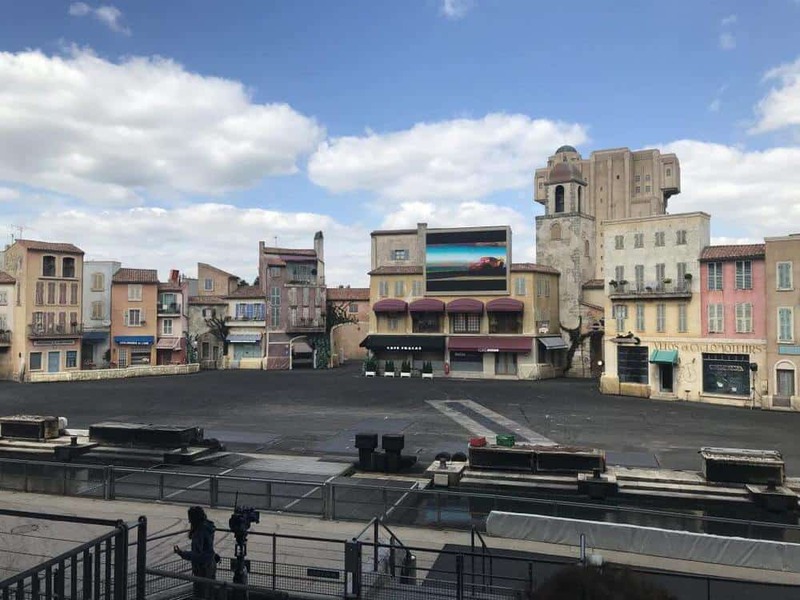 By the time we waited for the ICE train, switched between our other transfers (including time to use the bathroom and buy tickets), then wait for the shuttle at Disneyland Paris……my husband beat us to the hotel. So unless your children hate sitting in the car, driving is a cost-effective and easy way to travel. 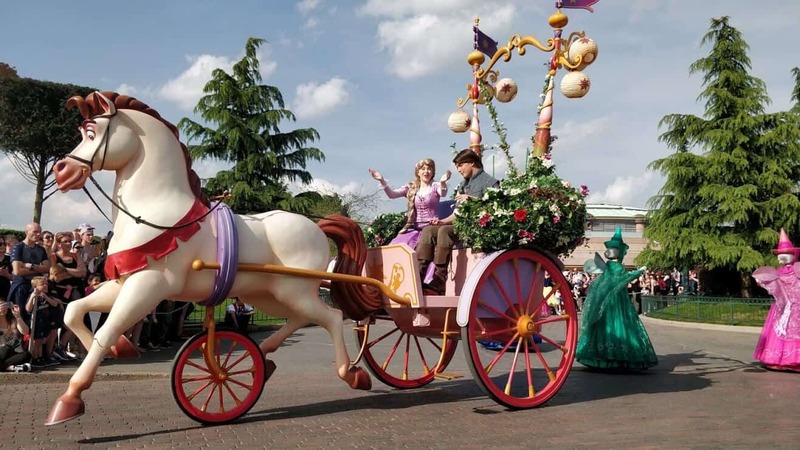 Here are some specific instructions for getting to Disneyland Paris from Paris itself. Metro from anywhere in Paris to the “Les Halles” train station. 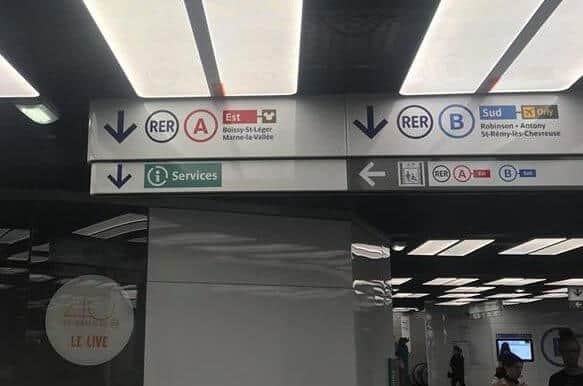 This is the station that you need to catch the RER train to Disneyland Paris. Once at “Les Halles”, you’ll see the Mickey Mouse ears to help guide you on the ticket machines. You’re looking for the Gare de Marne la Vallée Chessy train station. This is the train station directly outside Disneyland Paris. You’ll also see those helpful Mickey Mouse ears when you are looking for your train platform. Finding Disneyland Paris is easy, just follow the Mickey Mouse ears for the RER train. 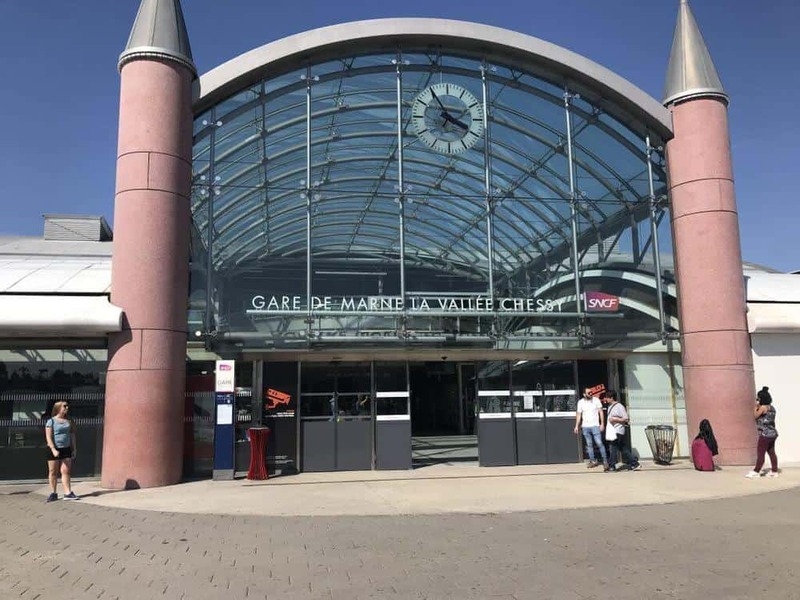 Once you’ve arrived at Gare de Marne la Vallée Chessy, you’ll exit the train station and see Disneyland Paris to your right and Walt Disney Studio to your left. You’ll want to walk around to your left towards the shuttle buses. The first row is reserved for all of the Disney Hotels (it is marked well). Other hotels that offer free shuttle buses are reserved for the other two lanes. I had a hard time figuring out where I was supposed to stand to wait for the shuttle to the Explorers Hotel. Luckily the staff is helpful. If the Explorer Hotel is where you’ve also chosen to stay, it is the farthest spot away from the entrance. Go to the last row and all the way down to the end of the row. This shuttle bus also services B&B Hotel and more, so don’t be confused when you see a bus with multiple hotels on it. Shuttles run every 20 minutes and there isn’t much to do or many benches to sit on, so FYI. 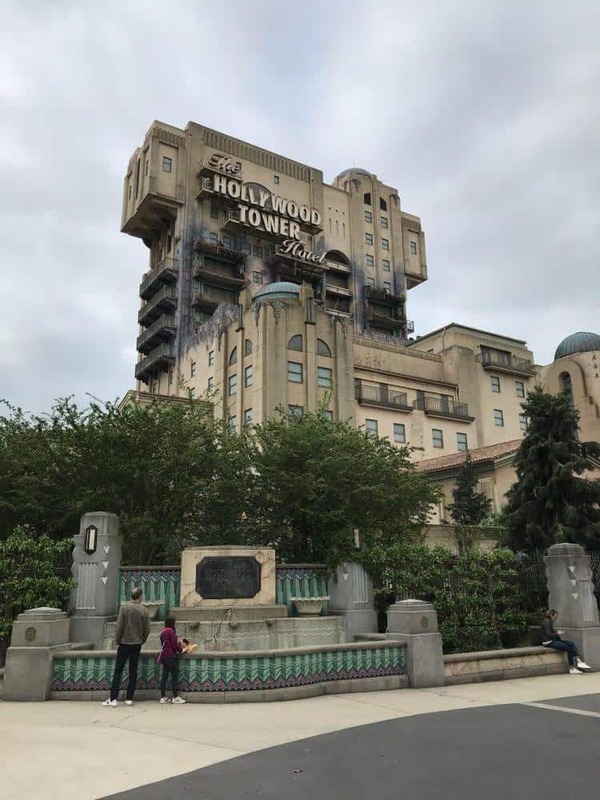 If you do stay at Explorers, they also offer free parking for their guests at the hotel, as well as at the park, just in case this is a better option for you. 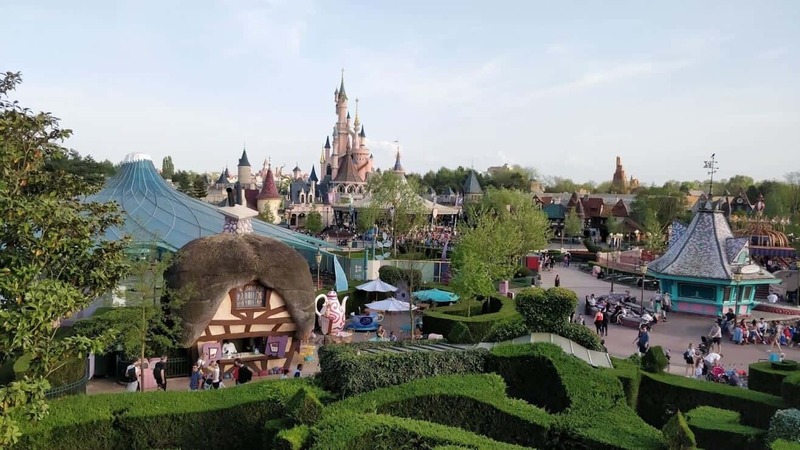 If you are arriving directly from the airport (Charles De Gaulle Airport), take the TGV direction to Disneyland Paris. We choose to stay in the Explorers Hotel. Mostly due to their child-friendly rooms, huge indoor waterpark, playgrounds (indoor and outdoor), Movie Theater and free breakfast. It was also much more cost effective when compared to the Disney Hotels. I know that some die-hard Disney fans only stay in Disney Hotels due to the extra perks, but this was a two-part travel for us and we didn’t want to spend the extra money. Nightly rates for Disneyland hotels range from $100/night for Hotel Santa Fe to over 1,000/night for the Disneyland Hotel. If you want to read an in-depth review of the Explorers Hotel, click on the link and you’ll get all the insights. 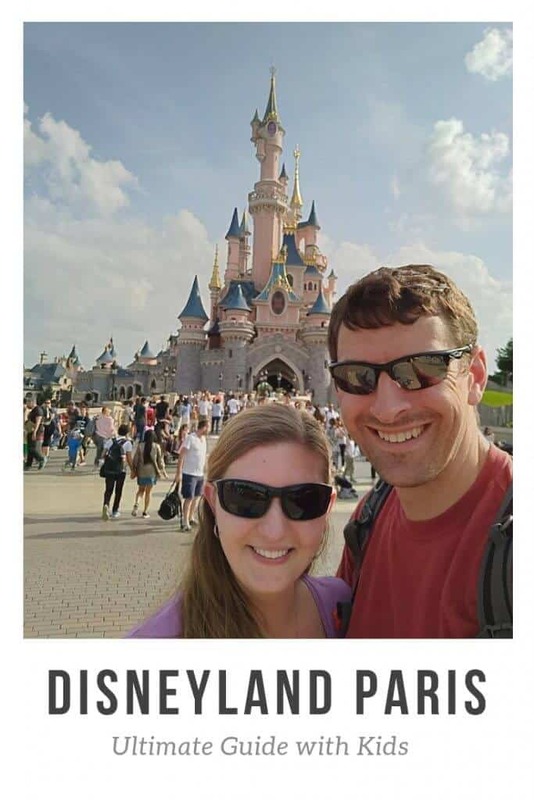 Where did we buy Disneyland Paris tickets? We are a military family, so we do luck out with some great advantages on discounted tickets. If you are also a military family, the best place to buy tickets is directly at Disneyland Paris. Present your ID to get your highly discounted 2-day (or more) tickets. There aren’t any discounts on the one-day ticket, but if you look at the prices, it’s actually cheaper to get a 2-day ticket when compared to a regularly priced 2-day ticket. If you aren’t military and want to book tickets, check out the Disneyland Paris Tickets Website. They offer tickets and you can skip the long lines at the entrance. If you will be a frequent visitor, check out their Annual Passes. Make sure to read up about the various types before you buy. If you want to stay at a Disneyland Hotel, be sure to check pricing and packages online via their website. Here is my TIP: Look at the prices in different languages! Go to your computer, click on this link using the Chrome browser, and then change the language/country. Chrome will automatically translate the page and you can compare the package costs. You’d be surprised to find huge differences by just changing the language and packages geared towards different countries. Crazy right? I’ve had friends save hundreds if not thousands using this trick. You can actually have more than one at a time. How?? If you pull a Fastpass from 10:00-10:30, you can technically pull another Fastpass starting at 10 am. The parks are also NOT connected, so you could grab a Fastpass from Disneyland park and then another from Walt Disney Studios Park. We didn’t attempt this but might work for teenagers with their young legs (the parks are near each other, but you’d have to exit and enter through the front). Have a plan for using your FastPasses, it is worth the extra research in order to maximize your time and spend less time in lines waiting. Fastpasses are included with your ticket at Disneyland Paris and you can’t reserve times like the US-based parks. You enter your ticket into a Fastpass machine (located near the ride, look for the signs) and then you’ll get another paper ticket with the time to return. When you return, go into the FastPass line and you’ll be riding soon! Once you use a Fastpass (or technically when your time has started), go to another machine to grab another Fastpass. If you time it correctly, you should be able to use at least 2-3 Fastpasses per day. You do not all need to be physically present to get a Fastpass. So mom or dad can take ALL the tickets and grab ALL the Fastpasses. This is effective when the ride is a bit further from another attraction that the kids want to visit. How should I use my FastPasses in Disneyland Park? Your FastPass strategy for Disneyland Park is a bit trickier. You’ll have to take your children’s interests and heights into consideration. I’ll give you a strategy without height restrictions and you can adapt it as needed. First, head to Big Thunder Mountain as close to opening as you can. If you have magic hours, head there around 9:30 am in order not to use a FastPass. Or, do what we did and pull a FastPass and then jump in line. The line does get really long at an opening. We were pretty far back and it was the first place we went to when the gates opened for regular admission. NOTE: Big Thunder Mountain often runs out of Fastpass tickets by early afternoon. Next: Head for the Discoveryland rides (Star Tours, Hyperspace Mountain, Buzz Lightyear). If it’s not peak season, avoid grabbing a FastPass for Buzz Lightyear. The two lines end up merging together and you won’t really save time waiting in line. After Discoveryland, head towards Peter Pan’s Flight or Indiana Jones. Indiana Jones will usually have Fastpasses late into the afternoon, but most other rides will have sold out by the mid-afternoon, so something to consider. How should I use my FastPasses in Walt Disney Studios Park? 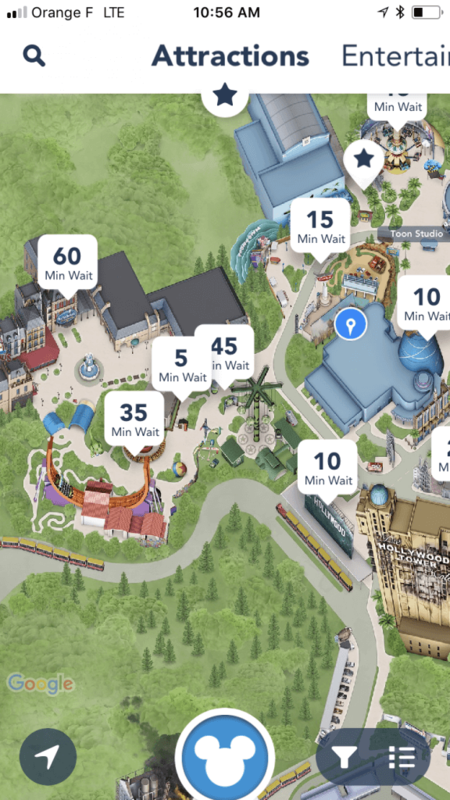 -The FastPass strategy in Studio’s Park is pretty simple, grab your Fastpass for Ratatouille and then for either Tower of Terror or Rock ‘n’ Roller Coaster (depending on the current wait times or ages/height of your kids). As most people will tell you, the food is pretty terrible and highly overpriced. Luckily you can bring your own food (if you choose). Try to have lunch before 11.30 or after 2 pm to avoid the crowds. 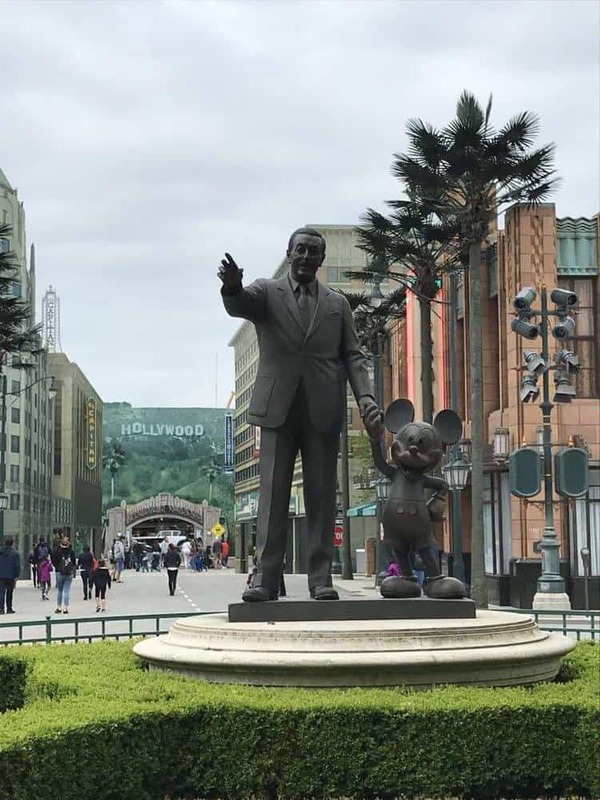 If your children love visiting the characters, you’ll have shorter lines and more luck in Walt Disney Studios Park compared to Disneyland Park. If this is a must for your child, check the schedule to see which characters will be where in the park. If the princess pavilion is on the list, get there early. If you have Magic Hours, I’d use one day to show up and grab a spot in line. Don’t forget to bring something to occupy the kids while they wait. NEW: You can now use an app called “lineberty” (available on android and apple). Be sure to download the app and then be ready at 9:45am, 10:45am , 2:15pm , and 2:30 to reserve a character visit. 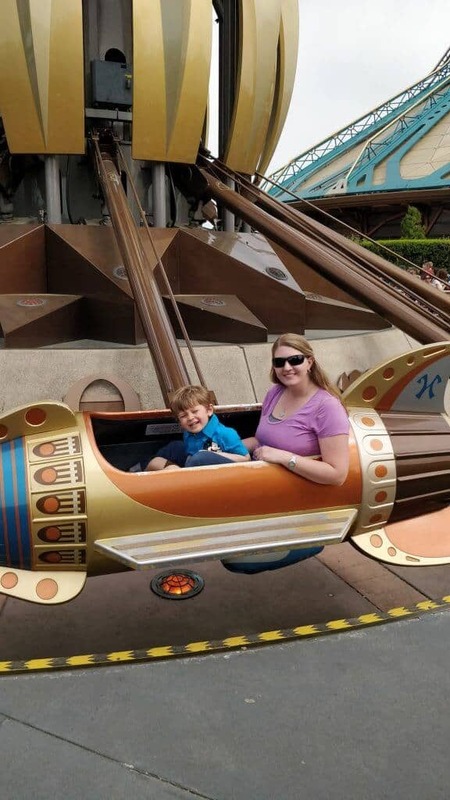 It can only be used in Hollywood Studios, but if both parents download the app, you’ll be able to reserve two slots or two different characters. Be sure to set alerts on your phone so you don’t miss a chance to reserve a slot to visit a character. Big Thunder Mountain: try to get there when Frontierland opens at 10 am. Then grab a Fastpass BEFORE you enter the line to ride. When you get off the ride, you should be able to use your Fastpass for a second ride. Also, Big Thunder Mountain is not as busy in the evening or at night (if you decide not to watch the Illuminations show). Rides that are popular and DO NOT have a Fast Pass: Disneyland Park: Pirates of the Caribbean and Phantom Manor. Walt Disney Studio’s Park: Crush’s Coaster. We really liked using the Disneyland app to check ride times, reference the map and find bathrooms. It’s free and easy to use. If you are visiting from outside of Europe, it would be worth paying for some data while in the park to access the app. You can pre-purchase or purchase a fun autograph book in the park. This way you can ask characters to autograph on their pages. Let the kids dress up as their favorite Disney character and add to the fun. They may also get some special attention if that particular Character catches a glimpse of them. Pin trading is another fun past time and there are some fun unique pins inside the park. You’ll need a stroller or foldable wagon to explore the parks. The parks are vast and little legs will get tired. We brought our foldable wagon with us and it was a lifesaver. 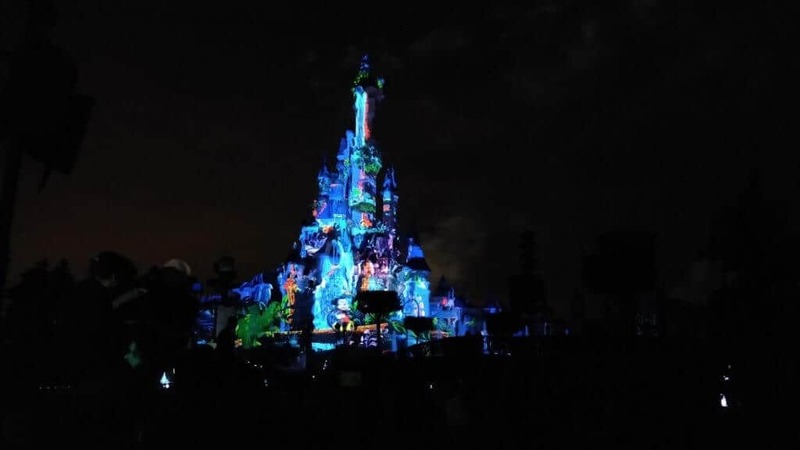 It also doubles as a nice backrest during the Illuminations show and a place for our son to take a nap. If you want to minimize shopping expenses, I’d recommend pre-purchasing items such as dress up clothes, autograph books, Disney trinkets (like these adorable Minnie ears from Amazon) and more. The best part, you can tuck them away and pull them out as needed! We purchased one item, a fun light and bubble maker. We still play with it here at home. Who can resist when little ones are waiting for the parade. Want to know how we spent our two days in the park with our 3.5-year-old son? After grabbing breakfast at the Explorers Hotel, we took the shuttle to get to the park around 9:30 am. If you have extra Magic Hours, then you’ll be able to access the park from 8:30-9: 30 am. Look for the special access line to enter. If you are like us, you’ll purchase your tickets (military) and then wait until the park opens at 10 am. There is a ribbon cutting ceremony and then the gates are opened! As previously mentioned, we used a FastPass strategy. Our son was 102cm tall, so we used that to guide our day. First off, Big Thunder Mountain. The central Plaza entrance is closest to Big Thunder Mountain, so head that direction. I waited in line with my son while my husband walked down to grab all three of us a FastPass. We knew this roller coaster would be a hit with our son, so riding twice was the plan. The line is long because people queue up to wait, but once the ride opens, it goes pretty quickly. Even though the ride started off broken down (insert an extra 30 minutes of waiting), we were able to ride, get off and then run back to the FastPass entrance (just in the nick of time) and ride it again. My husband actually ended up taking our son to the Pocahontas village during the ride breakdown. I sent a quick text when the line began to move. Next, we headed over to Discoveryland. We grabbed FastPasses to ride Buzz Lightyear and then headed off to ride Orbitron and ride the cars at Autotopia to wait for our time slot. My husband and I took turns on Hyperspace Mountain (using the single rider queue). Make sure to grab your Fastpasses in Discoveryland early, these are often the first to sell out. Since it was my birthday, we decided to have a special character dining. We chose the Sunday Brunch at the Disneyland hotel. It was just outside the gate and convenient to pop over to lunch and then come back into the park. Before leaving, my husband took off to grab a FastPass for Peter Pan’s Flight. It was an early evening time slot, which worked out with our schedule. Want more information on the character dining at the Disneyland Hotel? 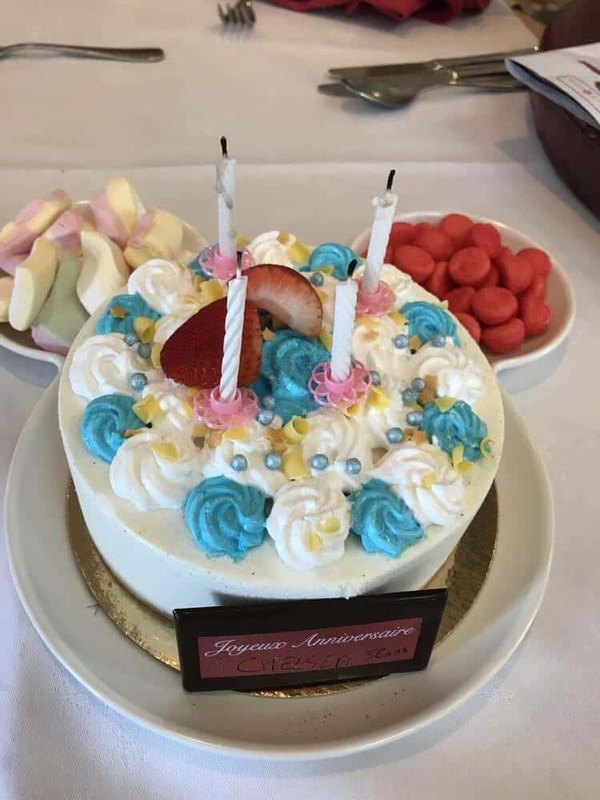 Check out my “Birthday Celebration at Disneyland Park” here. After lunch, we headed back into the park with a sleepy toddler in our foldable wagon. 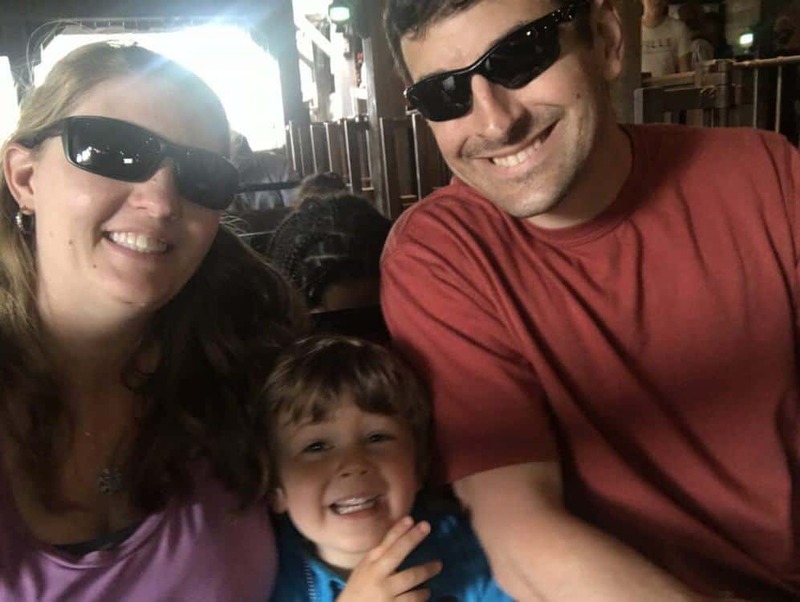 We took this break to check out the Disney castle, ride some of the rides that our son was not tall enough for (Indiana Jones) and grab a coffee (to enjoy a much-deserved break). If you have kids that don’t nap, continue the fun by hitting the rides in FantasyLand. After a nice nap, we continued the fun at the ride It’s a Small World, explored Alice’s Curious Labyrinth, and then used our FastPasses for Peter Pan’s flight once the time slot opened. 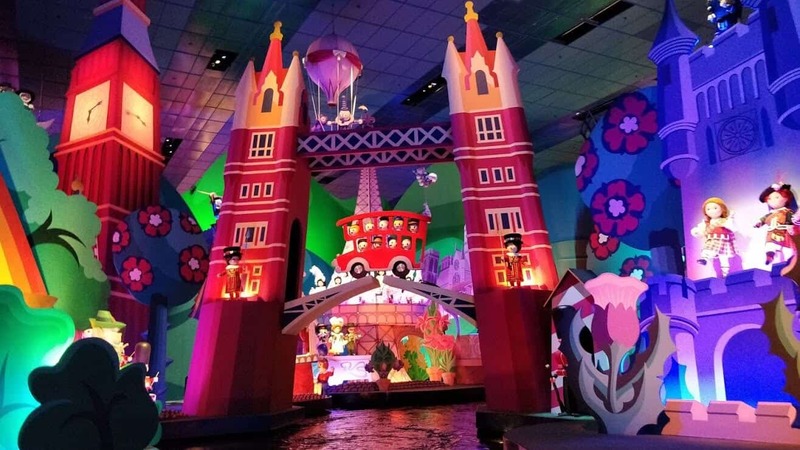 It’s a small world boat ride. View from inside the tower in the Labyrinth. There is so much to do in this area, so try to prioritize what you want to ride. It was a Sunday, so the crowds were already starting to diminish and the ride times were getting shorter. This is an evening parade, the current time is at 5:30 pm, but varies (so check the schedule). I recommend finding a spot in the Central Plaza directly off the main road or next to the fenced off patches of grass. The sidewalk is slightly elevated and if you sit on the curb, no one will be able to sit in front of you. We figured out the parade route and sat on the right corner with the floats coming directly towards us. Make sure you leave enough room to lift your legs off the road, they don’t like feet off the curb. TIP: In general, make sure that you pick an outer curve where you can watch the characters and floats coming towards you. If you stand on an inside curve or straight line, you’ll only see the characters and floats as they pass. Make sure to arrive early and watch for people that try to push into the smallest space. You can see the huge advantage of our location, the parade came straight towards us. We really enjoyed the parade and highly suggest grabbing a snack and drink before finding your spot. Don’t miss it. After the parade, we had a few hours to explore the park before the evening Illuminations show. We headed off to Adventureland to ride the Pirates of the Carribean ride. Then burn some energy on Adventure Isle exploring the rope bridges and hidden caves. Don’t lose the kids on this one! The Robinson Family treehouse is also a favorite and right next door. By this point, it was time to grab some dinner and prepare to stake out a spot for the Illuminations show. We headed back down to Main Street and grabbed dinner at Casey’s Corner. They had tables outside to enjoy dinner. Make sure you arrive early (I’d say 30-45 minutes before the show depending on the season). Make sure you have a nice view of the castle itself. All of the projections will be placed on the castle and partial views will ruin the experience a bit. The fireworks also take place just above the castle, so you won’t have a good view down by the exit or in the parking lot. The show lasts for 30 minutes and then the crowds make a mad dash exit, so be prepared. You know you are getting close to the end of the show when you see Peter Pan, in case you want to get a head start on the crowds. Phew! That was a busy first day! 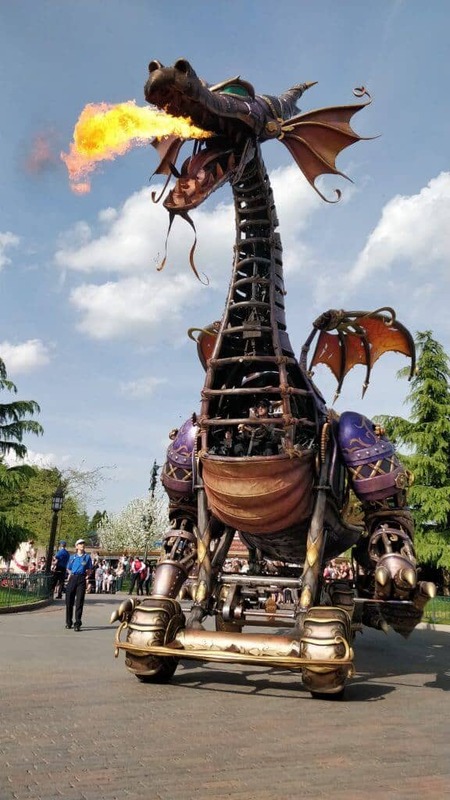 We did not watch any shows (other than the parade and illuminations) or wait to visit any characters, so if those two items are important to you, I’d plan those for the afternoons when the park calms down or first off in the morning to attempt to beat the crowds. We enjoyed our free breakfast and then decided to spend the next day at Walt Disney Studios Park. The gates open at 9:30 am, so we arrived early to head into the park as soon as they opened. We headed right towards the Tower of Terror to grab a FastPass and then jumped in line. We ended up helping the gate attendant while he stepped away for a couple of minutes and ended up in the FastPass line as a thank you. Score! The Tower of Terror was a hit with our son, so we rode again with our FastPasses that we pulled earlier. Next, we headed over to grab a FastPass for Ratatouille. My husband and I took turns riding RC racer (single rider line), while our son rode Slinky Dog and Toy Soldier Parachute Drop. By this time, our FastPasses opened up to Ratatouille. After that, my husband and I took turns riding Crush coaster (single rider line) as our son waited for the Cars ride and did the Flying Carpets. As lunch was approaching, we headed over to the backlot where we found a food truck offering as tasty French treat: Croque Monsieur. Probably the best food we had enjoyed in the whole park. A Croque Monsieur is a basically a baked ham and cheese sandwich, but it was really delicious! Find it across from the Restaurant Des Stars. After lunch, we took turns riding the Rock N’ Roller. This was a favorite! It does have a FastPass option, so grab one along the way if it fits in your schedule. Then both parents can trade off within the 30-minute window. 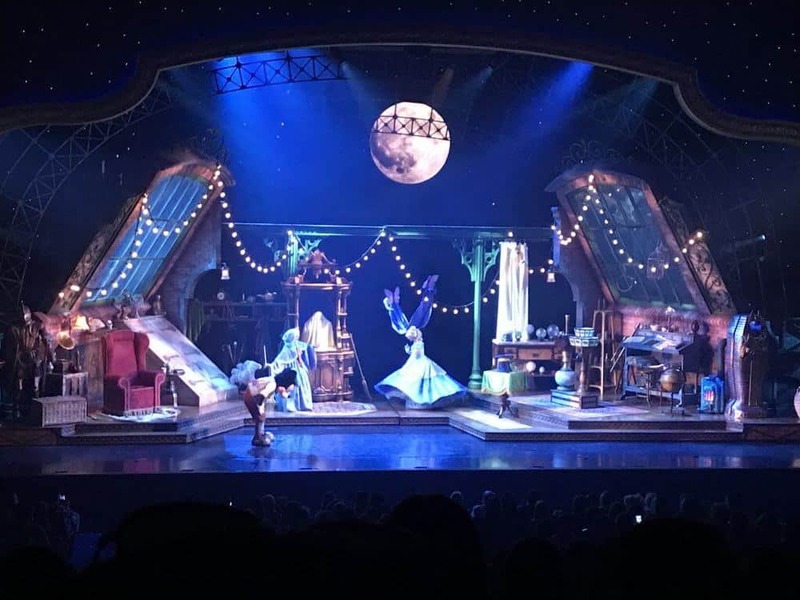 We also added a show, Mickey and the Magician. I would highly recommend this show. It was really cute and all the kids seemed to really enjoy it. A bit of magic, Disney Broadway entertainment, and good ole’ Mickey. There was an early afternoon Stunt Show and it was really cool! Arrive early if you want to sit in the center. Then you’ll enjoy a 20-30 minute show full of racing cars, jumps, stunts and fireballs! If you want a sneak peak of the show to see if it would interest you, see the short video below. We could have easily stayed in the park to enjoy more, but we wanted to transfer to Paris to see the Eiffel Tower before bedtime. Check out these top tips of things to see and do in Paris with Kids! We enjoyed our time in the parks and at the Explorers Hotel. We aren’t die-hard Disney fans, but Paris Disney has a nice mix of Disney fun with some Parisian flair. It also wasn’t overly busy at the end of April on a Sunday/Monday. Everyone in the park was helpful and spoke English, so don’t worry about the language barrier. It is nice to offer a kind “Bonjour” and you’ll need a few more phrases if you want to venture off the beaten path in Paris. You’ll also need euros for inside the park. Most restaurants accepted “chipped” credit and debit cards, but a few of the pop up stands only took cash. I hope you found this blog post helpful. I know I scoured the internet and Facebook groups when we were planning our trip, especially for the FastPass information. If you like this post and want to read more about our travels, head back to our destinations page, we’ve traveled all over Europe and the World and would love to share those travels with your family.